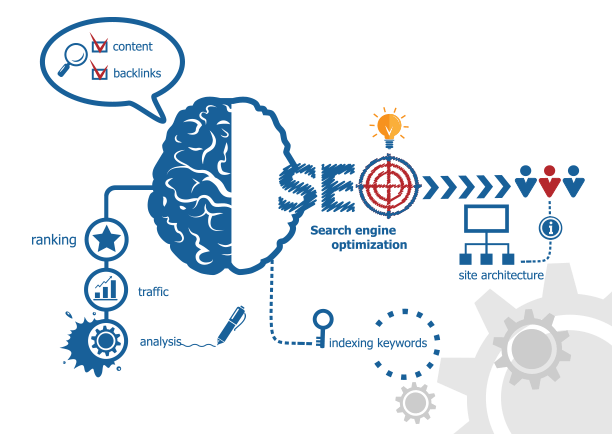 SEO is the activity of attempting to improve rankings on search engine websites. The major search engine used in the UK is Google so most companies attempt the rankings with Google algorithms in mind. Google has changed the way websites are ranked continuously for a number of years. One of the major ways of ranking higher is having relevant quality content. Great content encourages people to view and link to your page and this in turn shows Google that your content is interesting and relevant. This will help you rise through the ranks. Another way is having your website link to other sites. This doesn’t mean you should link your website to hundreds of website. You are far better linking to a few high quality websites that are ranked highly and have great content. Blogging is great way to get your website out on the internet, writing regular articles that are relevant will get you notice thus generating traffic on your site and improving your rankings. Social Media now plays a big role in SEO, regular posts on Facebook, Twitter and Linkedin will get you noticed. Digital Sky Design is a leading professional company who provides Local SEO Services in London. We are Expert in Digital Marketing (On Page and Off Page SEO), Social Media Marketing, Brand Promotion. Keyword Rankings and Quality Backlinks.